Actual garage dimensions will be determined by measurements which allow accommodating a certain type of a car or few vehicles inside. Theoretically, there are no standardizations and homeowner can design the garage according to practical needs. But many attached or even detached garages built by builders tend to have rather a minimum interior space for fitting compact to medium sedans or SUVs rather than spacious place possible to use as a workplace, keeping bikes or using the space for purposes others than just keeping a car. Most sedans, mid-size trucks and SUVs do not exceed 6.5’ in width excluding 16 – 20 inches for both sides mirrors and 17 feet in length. Based on such measurements usually 12 x 20 feet (3.6 x 6.0 meters) with a single 8’W x 7’H door will be typical minimum garage size having just enough room to fit one vehicle. It is definitely not an option for longer or wider pickup trucks or cargo vans which might require the garage to be at least 15’ x 24’ with a higher door. In order to be suitable for parking two cars garage has to be at least 18’ wide and 20’ long with minimum 12’ x 7’ single or 8’ x 7’ double doors. But 22 x 22 feet with 16’ x 8’ door attached garage is a very typical size for many single family houses. 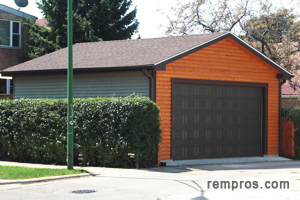 Minimum width of a garage for 3 cars should be about 28’ and 20 – 22 feet length. Three car garages typically have two doors – one smaller 8’ – 9’ wide and other bigger 14 – 16 feet in width. But separate door for each car might be more convenient option, even thought it might cost more. Maximum dimensions of detached garages build on standard city lots might be limited to certain sizes by local building codes. While designing a garage in rural areas on much bigger property there are typically no strict size limitations and it can be as big as you think it will be just an ideal size for a few cars, work bench, shelves and even some other stuff you might need to store or work with in the garage. How big the garage should be? The number and dimensions of cars you are planning to keep in garage is definitely a prior factor in determination how much space you will need. But always consider if the garage will be a simply covered area for parking a vehicle or you are planning to use its space for any other purpose. Those who like to work with cars and thinking about placing some equipment and special tools certainly won’t be satisfied with a 3 – 4 feet space around the vehicle. But for any family garage might be just a right place for keeping bicycles, motorcycle or even small Jet Ski if any in possession. With all that in mind always consider not a minimum or typical dimension while planning to build a garage but rather size big enough to satisfy your personal needs.